Prime Minister Sheikh Hasinaon today said Bangladesh is being built imbued with the non-communal spirit of poet Kazi Nazrul Islam. "Nazrul was motivated by non-communal spirit. So, we're building Bangladesh with this non-communal spirit. Non-communal spirit is reflected in our principle and ideology where people, irrespective of their race and religion, will enjoy equal rights," she said. 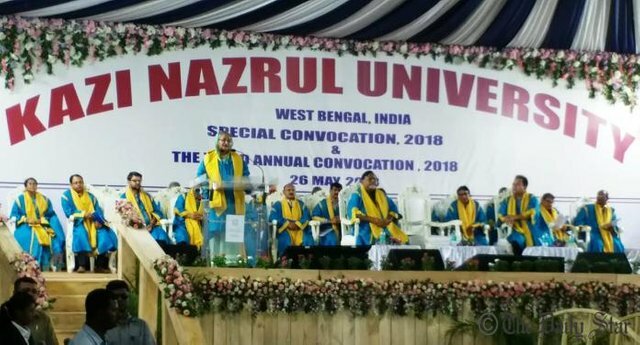 So, we hope you'll work with the same (non-communal) spirit," she said pointing at fresh graduates at a special convocation ceremony of Kazi Nazrul University (KNU). Sheikh Hasina was addressing the function after receiving Doctor of Literature (DLitt) degree from the university at Asansol in Paschim Bardhaman district.